It is the most widely used HTML and CSS based framework which contain styles for the main elements used in the HTML coding. Bootstrap is tremendously adaptable for any modification. It's not hard to manage with, features a superb grid system and considerable features number. It is an ability of the website to promptly adapt to any display size and resolution. Responsive design will help a web site appear equally nice on display screen of any sort of laptop or hand held gadget. Online chat makes reference to any type of interaction that occurs over the Net within the real-time. On-line Chat is a great solution for business websites. It allows assisting hesitating customers and encouraging them to make their final choice. On-line Chat makes your project appear more reliable and brings more clients to your company. Sample data installer is a module which allows to setup and add a trial data to a web theme fast and easy. Sample Data Installer allows you to easily install a design template with all the files and receive a ready-made internet site just the way you viewed it on the live demo. That's a element that helps to satisfy each and every individual and search engine expectations and achieve rank positions in the search. The Search engine friendly design means that the website will be successfully indexed and ranked higher by Google. Are there any restrictions for using imagery, cliparts and fonts from the PrestaShop design theme for High Fashion I purchased? All imagery, clipart and fonts used in PrestaShop design theme for High Fashion are royalty-free, if not stated otherwise on the product page, and are the integral part of our products. One Time Usage License and Developers License give you the right to use images, clipart and fonts only as a part of the website you build using your template. You can use imagery, clipart and fonts to develop one project only. Any kind of separate usage or distribution is strictly prohibited. Can I apply a discount code to a discounted PrestaShop design for Fashion & Beauty News or combine several discount codes together to get better price? 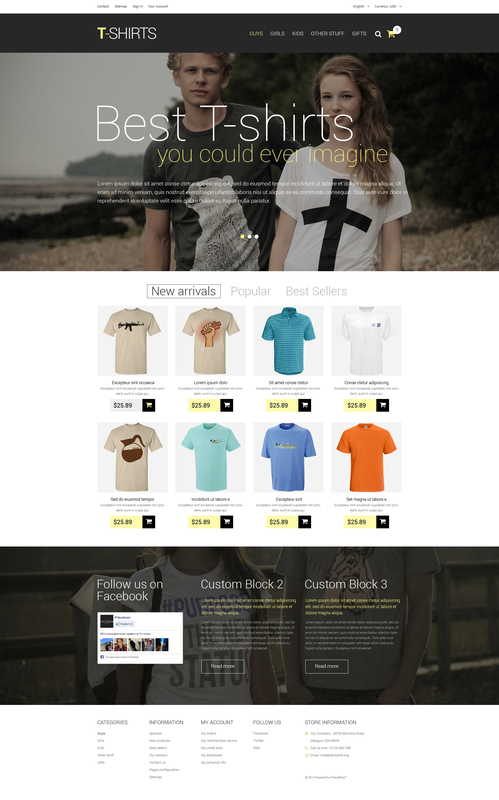 Will you help me to customize my PrestaShop ecommerce template for Designer T-Shirts Store? We do not provide any help or instructions on PrestaShop ecommerce template for Designer T-Shirts Store customization except for www.template-help.com help center. If you are not sure you can customize the template yourself we recommend to hire a design studio to customize the template for you. Is there any return policy for PrestaShop designs for Kids Fashion? Requests for a refund are accepted at www.template-help.com/tickets within the period of 2 weeks after the order of PrestaShop template for Fashion Magazine is placed. You should accompany this request with detailed and grounded reasons why you apply for a refund. Please make sure your request does not contradict the terms and conditions specified in the policy. A refund is issued to you upon receipt of a Waiver of Copyright signed by you. I would like to make payment for PrestaShop design theme for Teen Fashion by company check. Is that possible? Please use Skrill payment option. They accept payments by check.You can place an order for PrestaShop design theme for Teen Fashion on the site under the name of the company and choose Skrill merchant system for making payment from the company's account. To initiate bank transfer, please create an account here - www.skrill.com, add the number of your bank account and verify it. After that, you can place an order on our website and choose Skrill on checkout page. When the payment is made, the product will be sent to your e-mail along with the invoice under the name of your company. Can I resell Fashion & Beauty News PrestaShop designs I bought the developers license for? You cannot resell the customized PrestaShop design theme for Women T-Shirts Retailer as a template, but you may sell it as a project to your client. Are there any limitations on selling the PrestaShop ecommerce theme for Fashion Stylist as the integral part of my new product? Is it possible to use your PrestaShop design themes for Fashion & Beauty to develop websites for my customers? Yes. It is perfect for designers who want to offer their customers a high-quality design and also save time and money. Keep in mind that when you purchase the PrestaShop theme for Guy T-Shirts Store with ordinary or exclusive license you're entitled to create only one project (one domain name). Make sure that these charges for T-Shirt Printing Shop PrestaShop design have different order IDs. If it is so, contact our billing department. Can I customize the PrestaShop design for Fashion & Beauty Store? Yes, you can customize the PrestaShop design for Fashion & Beauty Store to any extent needed. You cannot use a header of the template for one project though, and images from the template for the other project. Can I put a line at the bottom ( or any other spot) of the customized PrestaShop ecommerce theme for Streetwear Fashion "Website design by Company name"? No, you cannot place a line at the bottom ( or any other spot) of the customized PrestaShop ecommerce theme for Streetwear Fashion saying "Website design by Company name". Nevertheless, you can place "Customized by Company name". Will the PrestaShop theme for Men T-Shirts Retailer be deleted from TemplateMonster database? No, the PrestaShop theme for Men T-Shirts Retailer will not be deleted from TemplateMonster database. What am I allowed and not allowed to do with the PrestaShop design themes for Fashion Magazine? You may: Build a website using the PrestaShop theme for Fashion Designer in any way you like.You may not:Resell or redistribute templates (like we do).Claim intellectual or exclusive ownership to any of our products, modified or unmodified. All products are property of content providing companies and individuals.Make more than one project using the same template (you have to purchase the same template once more in order to make another project with the same design). Can I resell the Fashion Trends PrestaShop design theme as is? No, you cannot resell the Fashion Trends PrestaShop design theme as is. Is it possible that Template Monster will contact my client which website I made from Template Monster's website Fashion & Beauty PrestaShop ecommerce template? Yes, our legal department checks licenses regularly. In case we won't find designer's contact information on the site which was made from the Fashion & Beauty PrestaShop ecommerce template of ours we will contact the owner of the site directly. Can I use graphics from PrestaShop design theme for High Fashion I purchased for use in printing? Yes, it's not prohibited to use the PrestaShop design theme for High Fashion graphics for printed material, but the resolution of the templates graphics ( except for logo templates) is not enough for printing. Can I get the PrestaShop theme for Guy T-Shirts Store in higher resolution to use for printing? No, we design PrestaShop themes for Online T-Shirt Shop optimized for web resolution only. Can I put a line at the bottom (or any other spot) of my new product "Website development by Company name" after purchasing PrestaShop design theme for Fashion Blog? Yes, you can place a note at the bottom (or any other spot) of my product "Website development by Company name". Nevertheless, you cannot place "Website design by Company name" while using one of PrestaShop design theme for Fashion Blog. Can I contact the Fashion Consultant PrestaShop design author? Yes. You can contact this Fashion Consultant PrestaShop design author/author's team directly using your personal account under the Support tab. What is Developers License for PrestaShop template for Fashion Clothes? If you purchase a Developer's license, you are granted a non-exclusive permission to use the PrestaShop template for Fashion Clothes on up to 5 domains for projects belonging to either you or your client. Can I integrate the PrestaShop ecommerce theme for Streetwear Fashion with third-party software or applications for development of my new products? No, you cannot get the developers license for development of PrestaShop ecommerce theme for Streetwear Fashion or other products.